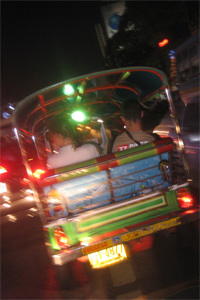 You often see two or three people on scooters or motorcycles in Thailand. But it took me a while to realize that some of these were actually taxis, and the passengers were paying for a quick ride to somewhere. After I completed making plans for our escape, I was so overjoyed that I spontaneously jumped on one and just asked him to take me for a ride, to someplace where I could get a drink. 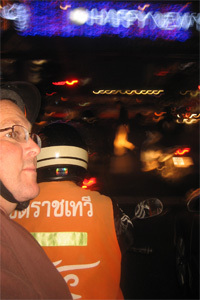 He rode me around for about 10 minutes -- a wild and dangerous ride through traffic, around cars, and between lanes. The second one was even wilder -- or at least seemed so, since it was dark and I had two beers in me. 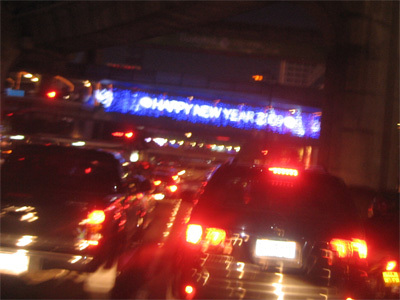 I was having a pretty good time, and as my driver weaved in and out around cars, I shouted to him, "You're crazy!" He just laughed and drove me over to Judi and Craig's. I told them how I'd got there, and Judi said. "Oh, those are all run by the mafia."